Jio Payments Bank commenced its banking services on 3rd April 2018. Paytm founder Vijay Shekhar Sharma promoted Paytm Payments Bank began operations from May 2017 last year while FINO Payments Bank Limited kicked-off in in June last year. Birla group's Aditya Birla Idea Payments Bank was the latest in this space whose operations were started from February 22 this year. 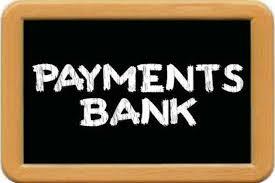 Payments banks are being promoted by the Reserve Bank to further financial inclusion by giving services such as small savings accounts, payment or remittance services to migrant labour workforce, low income households, small businesses and unorganised sector entities as well as other users. While, the Department of Posts, which also got a license for a payment bank is yet to start its services formally, who is running services on pilot basis currently. Payments banks is a new model of banks conceptualised by the Reserve Bank of India (RBI). These banks can accept a restricted deposit, which is currently limited to ₹1 lakh per customer and may be increased further. These banks cannot issue loans and credit cards. Both current account and savings accounts can be operated by such banks. Payments banks can issue services like ATM cards, debit cards, net-banking and mobile-banking. On 19 August 2015, the Reserve Bank of India gave "in-principle" licenses to eleven entities to launch payments banks.